Krishnamachari Bose was born in 1963 in Kerala. In 1991 he received his degree of Bachelor in Fine Arts from Sir J.J. School of Art, Mumbai. In 2000 he received his degree of Master in Fine Arts from Goldsmiths College, University of London. In 1989 he exhibited solo at Kerala Kala Peetom, Kochi. In 1990 he had a solo exhibition at Sir J. J. School of Art, Mumbai. In 1991 he had a solo show at British Council Gallery. In 1992, 1993 and 1999 he exhibited Amuseum and Amuseum Memoirs at Jehangir Art Gallery, Mumbai; at Park Sheraton, Chennai and Sakshi Gallery, Bangalore. From 1995 – 2006 he had several solo shows in Mumbai, Kochi, and New York. In 2007 he exhibited LaVA (Laboratory of Visual Arts, a traveling installation project) in Mumbai, Bangalore, Kolkata, Kochi, Baroda and New Delhi. In 2007 he exhibited solo at the Peabody Essex Museum, Salem in Massachusetts. In 2008 he exhibited Ghost at AICON Gallery, London. In 2009 he showcased Only One To Let – White Ghost at Kashi Art Gallery, Kochi. In 2010 he had a solo, NO: Bose Krishnamachari at 1x1 Contemporary in Dubai. In 2014 he exhibited Maximum Bose: Stretched Bodies at Gallery 7, Kala Ghoda, Mumbai. From 1991 - 2000 he took part in various group shows in Mumbai, New Delhi, San Francisco and London. In 1992 he took part in Artists against Communalism at J. J. School of Art & Shivaji Park, Mumbai. In 1993 he participated in Circling the Square at Jehangir Art Gallery, Mumbai and CCA, New Delhi. In 1995 he participated in Bombay: An Artist’s Impression at Jehangir Art Gallery, Mumbai. In 1997 he participated in 50 Years of Art in Mumbai at NGMA, Mumbai. In 1998 he took part in The Presence of the Past at NCPA, Mumbai. In 2000 he participated in a group show at Goldsmiths College in London and Lakeeren Art Gallery, Mumbai. In 2000 he participated in Memos of the New Millennium at Birla Academy of Art & Culture, Mumbai and in Mumbai Metaphor at Tao Art Gallery, Mumbai. From 2001- 2008 he took part in various group exhibitions in Tokyo, New Delhi, Mumbai, Kochi, Baroda, New York, Singapore, France, Milano, Dubai, Paris, Kolkata, Austria and Germany. 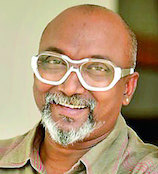 In 2003 he participated in Ideas And Images at NGMA, Mumbai. In 2003 he participated in Remembering Bhupen…: Homage to late Bhupen Khakkar at Kashi ArtCafe, Kochi. In 2004 he took part in Anticipations at Jehangir Art Gallery, Mumbai and at The Museum Gallery, Mumbai. In 2005 he took part in Paths of Progression (a travelling show) in Mumbai, New York, Singapore and New Delhi. In 2007 he participated in India 20 at Lalit Kala Akademi, New Delhi. From 2009 – 2013 he participated in various group shows in Mumbai, New Delhi, Trivandrum, Kolkata, USA, Korea, Singapore and Kochi. In 2010 he participated in Indian Highway, a traveling art project at Serpentine Gallery, London; Astrup Fearnley Museum of Modern Art, Norway and at Herning Kunst Museum, Denmark. In 2010 he participated in Master’s Corner at Jehangir Art Gallery, Mumbai. In 2011 he took part in Love, a group show at Latitude 28, New Delhi. In 2012 he participated in Ghost Transmemoir at Art Stage, Singapore. In 1985 he won the Kerala Lalithakala Akademi Award. In 1991 he received a Gold Medal from Mumbai University and won the Bombay Art Society Award in Mumbai. In 1993 he won the British Council Travel Award to UK. In 1996 he won the Mid America Arts Alliance Award for Extensive Travel And Residency. In 1999 - 2000 he won the Charles Wallace Indian Trust Award To UK. In 2009 he won the Kerala Lalithakala Akademi Fellowship Lifetime award. Bose lives and works in Mumbai & Kerala.